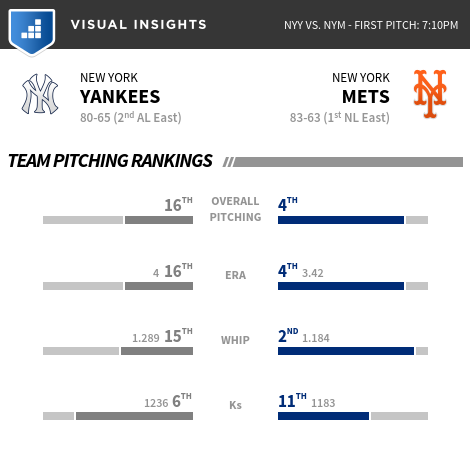 A Yankees-Mets matchup always excites fans in New York City. 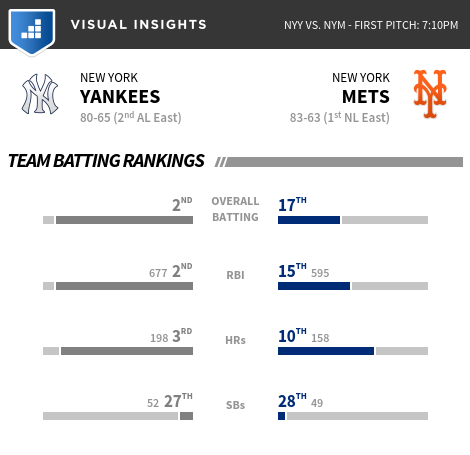 But when the teams take the field Friday night in Queens this late in the regular season for the first time, a whole lot more than bragging rights will be at stake in the most meaningful games they’ve played against each other since the all-New York World Series in 2000. The Mets are closing in on their first playoff appearance in nine years, sitting atop the NL East by eight games over Washington with 16 to play. A fan base frustrated by September collapses in 2007 and `08, the Madoff financial scandal and six straight losing seasons has been rejuvenated by a cadre of young aces and a ”Cespedes for the rest of us,” as Jerry Seinfeld tweeted about the arrival of slugger Yoenis Cespedes. The Yankees lead the AL wild-card race and trail first-place Toronto by 3 1/2 games in the AL East with 17 remaining. They missed the playoffs the past two seasons, and home attendance will likely be the lowest it’s been in 15 years. A series that in June or July turns friends – and even families – against one another will rise to new levels of hype and hyperbole. MISSING PIECES: The Yankees have been slowed by the loss of first baseman Mark Teixeira, who was leading the team with 31 homers before breaking his leg on Aug. 17. A-Rod played only a handful of early games in the field this season, and with no designated hitter available in the National League ballpark, manager Joe Girardi has no plans to use his No. 3 hitter – and current home run and RBI leader – except as a pinch hitter.